VIRTUALLY ANYONE CAN LEARN REMOTE VIEWING! The CIA and U.S. Army developed a protocol with over 20 million US dollars of funding called Remote Viewing (RV) that enables the unconscious mind's inherent ability to obtain knowledge about any person, place, thing in the past, present or future. What seperates official Remote Viewing protocols from anyone else is that virtually anyone can learn this and no previous experience or "abilities" are required! HOW DOES THE RV TRAINING WORK? 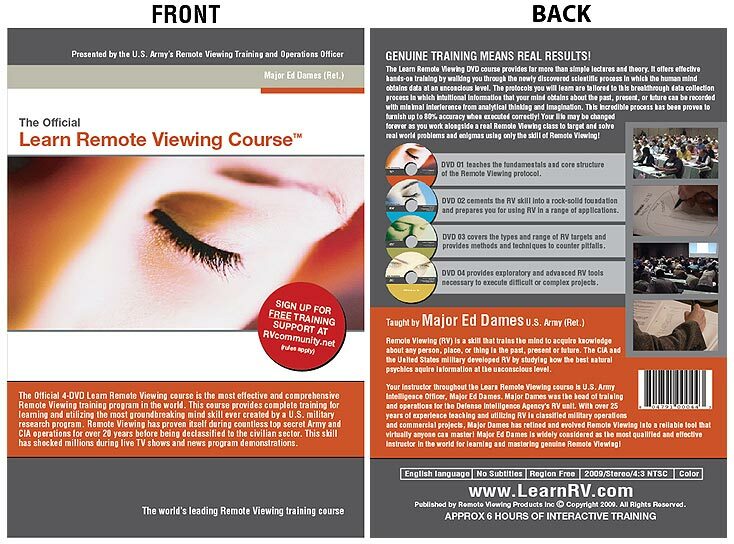 The Learn Remote Viewing DVD course was built entirely from the ground up to offer a user friendly experience that provides easy-to-follow, step-by-step instructions and interactive lessons as you proceed through each training stage. After each lesson, you will execute a blind practice target that incorporates what you have just learned; conducting each Remote Viewing practice session right along with the classroom students on the DVDs! After each session has ended, detailed feedback is immediately provided and the target is revealed; comparing your session results with the actual results of the classroom students! The feedback segments will show you how accurately you hit the target and where your pitfalls may have been so that you quickly and continually become more accurate! The course was designed to allow you to go through each DVD at your own pace!